Dogs are said to be the human’s best friend because they only know the language of love. We have already written about the small dog breeds now let’s talk about the biggest dog breeds in the world. There are many variations in the Dogs depending on the height and weight. The heaviest dog recorded in history was a St. Bernard, which weighed around 166 kg. Few of them are also listed in best guard dogs around the world for security. It has been scientifically proved that despite the threatening body big dogs are mildly tempered and relaxed animals and are also very popular pets all around the world. Dogs also listed in one of the friendliest animals in the world. Big dogs are usually not suitable for an indoor life and need open spaces and lots of exercise for a healthy. Such breeds are preferred by those who own farms and livestock or those who can commit to providing proper exercise to the dog. So, here are the 15 biggest dog breeds in the world. If we consider the mass, then the English Mastiff is the largest dog breed in the world. They are considered to be descended from the ancient Alaunt and Pugnaces Britanniae. Apart from being the largest dog breed, these dogs are also very popular as pets and are usually kept on farms. The male variant will weight around 150 to 250 pounds (68 to 113 kg), and the female variant will weight around 120 to 180 pounds (54 to 82 kg). The Guinness book of world records has the data of a dog named Zorba, who belongs to the English Mastiff breed as one of the longest and heaviest dogs in the world. The record was set in November 1989. The breed was 8 years old at 37 inches high at the shoulder and weighs around 343 pounds. The dog weighed around 142.7 kg and had a height of 27 inches. They are also known as old English Mastiff. The massively sized mastiff dogs have been used by the Romans for gladiatorial fights. The used to bark very less but are very prompt in smelling the threats around them. It is one of the biggest dog breeds in the world. English Mastiff is the world’s largest dog in terms of mass, though not the tallest. Originated in England, they served as watchdogs for thousands of years. Talking about the appearance, the dog breed has a short and sleek coat that can be light-yellowish brown or light yellowish-brown mottled with black. The head is enormous and large with a broad and heavy body. The breed is known for its gentle, calm and loyal behaviour. It will be an excellent choice for children and other pets in the home. The dog breed cannot be easily trained because of stubborn and sensitive by nature, however, it will respond well to affection and positive reinforcement. The Great Dane is the German breeds known for their enormous body and great height and is one of the dangerous dog breeds in the world. The Great Dane dog named Zeus has been named as the tallest dog in the world according to the Guinness book of world records. Freddy, Great Dane is the world’s biggest dog with 7ft 6in who loves chicken and peanut butter. The weight of the dog will be around 50 to 90kg and height will go up to 44 inches. They are initially developed as hunting dogs. The growth in these dog breeds are very fast, and the puppies will reach the height of the adult in a year. The nature of the dogs is very charming and gentle. They are also known for their playful activities. It is the second biggest dog in the world. Great Danes are well known for being the world’s biggest dog breed, or at least the tallest. Common coat colours are brindle, blue, black, fawn, harlequin, and mantle. It is also one of the shortest living dog breeds in the world. The Great Dane is also one of the most popular pet breeds in the world and people love these dogs due to their gentle and watchful nature. They are also very loyal to the family and play along well with other pets and children in the house. According to The American Kennel Club Registration, the great Dane is the 15th most popular dog breed in the world. It was recognized by AKC in 1887 with 3 markings and 9 approved colours. The fur of great Dane comes in three varieties that include fawn and brindle, harlequin and black and blue. The head of the dog breed is massive and long with a muscular body and triangular ears. The dog behaviour is calm and affectionate and will be a good choice for families with children and other cats and dogs. The breed hates to be alone and spend times with family. Also, proper training is required to prevent aggressive behaviour in front of strangers. This is one of the largest dog breeds in the world and has been originated in North Italy and Switzerland, and they are known for its muscled body and strength. They are famous for their legendary alpine rescues. St. Bernard is a giant dog breed named after the great St. Bernard Hospice. They are initially developed for the rescue operations in the Alps. The only drawback is that they need proper training for everything else they can be very dangerous and destructive. The well trained St. Bernard breed is very friendly and patient. They are also known for its enormous size and one of the biggest dog breeds in the world. The average weight of the breed will vary between 65 to 120 Kg and the height 70 to 90 cm. The dog is not very playful but has a great attachment to his family. They were utilized as rescue dogs to pull travellers from the snow. The longest dog in history, Major F(St. Bernard), allegedly reached a length of eight feet and six inches. They are usually in red and white with black shading. This breed has become more popular as a pet since St. Bernards have been cast in many movies, making them minor stars! St. Bernard has been recognized to save around 2000 people from the hazards of the Alps. Initially, it was known as “Barry Dog” or “Noble Steed” before getting the name St. Bernard during the mid-1800s. It was used for guarding of monks in the isolated monasteries and later it was discovered that t can easily find passengers or travellers trapped inside the snow. Later, it was transferred to the Alps where this dog managed to save thousands of lives. The intelligent and warm dog breed will be the perfect choice for families with other kids and pets. It also likes to spend time with family and hate to be alone. They are also known as Mastino or Mastini. They are one of the ancient dog breeds that were initially developed as a protector of the family due to its instinct and the fearsome looks, which are a result of this dog’s large size. The first mastiff-type dogs are believed to have been developed in Tibet about 5,000 years ago. They are being originated in Italy. The weight of the dog varies from 54.4 to 90.4 kg and the height from 26 inches to 30 inches. They also need some kind of early training but the breed is very gentle, intelligent and family lovers. Neopolitan Mastiff is a fearless and extremely protective companion. This massive breed is often used as a guard and defender of family and property. The body of this massive, rather rectangular looking dog has abundant, hanging wrinkles and folds on the head and a very large dewlap. They will be available in many colours like grey, leaden black, brown and fawn. Since this is one of the biggest dog breeds in the world, its lifespan is relatively short with a maximum of 10 years and they need proper grooming and a healthy diet to keep them fit. Also, read about cutest dog breeds in the world. The body of the breed is covered within loose skin, however, the coat is grey, black, mahogany or tawny giving them the appearance of a scowling executive in an ill-fitting suit. The roots of the breed will go back to Italian soil and believed to be descended from Roman war dogs. It is quiet and watchful dog breed who is protective of his family and other pets. You need to give a regular bath to your Neapolitan Mastiff for keeping a shine on his short and dense coat with oily skin. They are usually known as domestic dog breeds and one of the biggest dog breeds in the world. They are being originated in Ireland and known for their very large sighthound. As the name suggests, they were initially used for hunting and guarding. They are the tallest breeds among all dog breeds in the world. The Irish Wolfhounds are the tallest dog breeds in the world that can grow up to 28 to 32 inches tall and weighs around 150 lbs. The legs of the dog are very long and strong. The growth of the dog is a little slow and they need at least two years to become mature. The breed is very intelligent and is very patient. 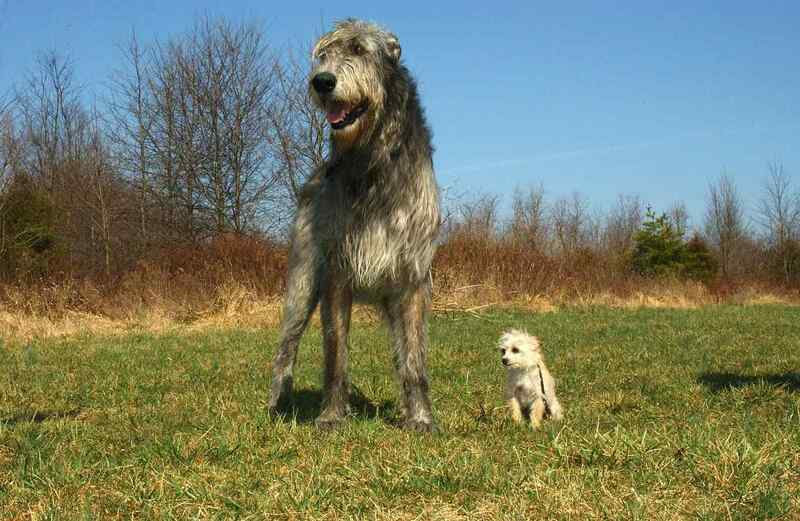 Irish wolfhound found to be bigger than Great Danes by average. Although lightweight, these dogs are one of the biggest dog breeds by height. Roman records describe these ancient war hounds with awe and fear. The appearance of these dogs is harsh and shaggy and coat in grey, brindle, black, red and white or fawn. The temperament of these dogs can be described as Sweet-Tempered, Loyal, Patient, Thoughtful, Dignified, Generous and despite being one of the largest dog breeds in the world, they are extremely good natured. There was a time when Irish Wolfhound came extinction, however, later in the 19th century Captain George Graham stepped in and started cross-breeding the remaining Wolfhounds with other dog breeds and taken approximately 23 years in completely restoring the breed. The breed has served as the Regimental Mascot of the 1st Battalion Irish Guards since its formation in 1900. In order to increase the popularity of teh dog breed the mascot is typically named after a famous historical figure. The Leonberger is known as a giant dog breed. They are being originated in Germany and names come from the city of Leonberg in Baden-Württemberg. Three of the world’s largest dog breeds were involved in the creation of Leonberger. These are the Newfoundland, St. Bernard and the Great Pyrenees. The weight of the dog will vary from 45 to 77 Kg and height of the dog will vary from 26 to 32 Inches. They have a lion-like appearance with the thick double coat. The coat can be of different colours such as yellow, sand, brown, and red with shades of black. Frequent brushing is required on a regular basis if you want your home to clean. They usually found in four colours namely yellow, red, cream and brown. The dog is very intelligent, and you can’t raise a question of their loyalty. They like children and are very patient. They are one of the giant dog breeds with a thick double coat and leonine. Like most other large dog breeds, the Leonberger has a shorter lifespan – about 7 years – and can have some medical problems later in life due to its large size. Additionally known as “gentle giant,” where females Leonberger can reach 29 inches high, however, males reach around 31 inches in height. According to Leonberger Club of America, the Leonberger first appeared in Leonberg, Germany in the 1800s. During World War I, the dog breed almost came to extinction, however, later two Leonberger breeders began a club committed to conserving the Leonberger dog breed. There are various programs taken by the German government during the war and slowly numbers began to increase. Newfoundland is also one of the largest dog breeds in the world with weight varies from 60 to 70kg and height 27 to 30 Inches. They also vary in colours like black, brown or white and black. Newfoundlands are not the world biggest dog breed by either height or weight, but exceptions occur. These dogs can top 200 pounds and measure six feet. They are originated in Canada. The breed is known for its strength, intelligence, and loyalty. They have extraordinary swimming abilities, and that is the reason they can be a good rescue or life-saving animals. They are smart enough to smell a threat around them and well suited for the children as they are very calm and friendly. Newfoundlands have a water-resistant coat and are named after the island of Newfoundland where they were bred. They were originally bred to be used by fishermen to haul nets and wood for building ships. They can work very well in water and on land and so are the best dogs for those living on the coast. Despite being one of the largest dog breeds, they do not look fearsome and are very gentle animals who love the family. The dog breed has a double coat that helps them in keeping warm during freezing temperatures and have webbed feet. The nails of the dog breed grow fast and should be streamed on a regular basis. They are good swimmers and coat naturally stays soft and straight, however, it might get a little scraggly at the ends. The Anatolian Shepherd which originated in Anatolia but it was further developed in America. The weight of the dog varies from 41 to 68 kg and height varies from 26 to 31 Inches. They are basically known for their endurance. They are known for their intelligence, strength, loyalty and protective. One of the most independent biggest dog breeds in the world who can take of themselves and even the people around them. If they smell any intruder they used to bark a lot. They love to play with children and the parents must be careful as the dog breed is very strong and powerful. This powerful dog breed was never a pampered dog breed for royalty; for 6,000 years and has a fierce protective instinct. Their colouring and size bed to help it blend in with livestock as they mainly used in protecting farm animals. This is one of the largest dog breeds in the world and is very muscular with thick necks and sturdy bodies. Their ears are triangular and they have a tight muzzle along with a thick coat that makes them appear larger. Anatolian Shepard Dog is capable of great love and royalty. They are also known as the Great Pyrenees in North America. They are known for their protective nature and beauty. They are also known for their loyalty, gentle and obedient. They have a great sense of hearing. They detect the intruders and other animals easily and also bark a lot. The Great Pyrenees are working as the watchdogs since 3000 B.C.Great Pyrenees is also known as Pyrenean Mountain Dog. The length of the dog is slightly longer than it is tall. The nose and lips are black. The dog has a weather resistant double coat. The undercoat is dense, fine and woolly. The outer coat is long, thick and flat. They are generally used to guard livestock. When not provoked, it is calm, well-mannered and somewhat serious. It is very gentle with his family and children. This large dog breed is not suitable for living in apartments since they need lots of physical activity and are not very tolerant of being alone. They also shed heavily and this can become difficult to clean in an apartment. They can be easily trained and are very friendly towards strangers. It has been believed that the Great Pyrenees has been arrived in the Pyrenean Mountains along with their shepherds approximately in the year 3,000 B.C. They are also known as Dogue de Bordeaux. The breed is famous for its massive head and muscular body. Their weight can vary from 54 to 62.2 kg and height 20 to 23 Inches. They are being used for heavy works like pulling carts and hauling heavy objects. They are always very efficient in guarding flocks. In the past, they are used to guard castles of the European elite. It is also one of the largest and biggest dog breeds in the world. Like the English Mastiff further up on this list, the Dogue de Bordeaux is one of the oldest breeds in Europe. The most distinctive feature about the French Mastiff is their gigantic heads. This breed became very famous after a French Mastiff starred in the movie Turner and Hooch with Tom Hanks. Though this one of the largest dog breeds in the world, they are suitable for living in an apartment but are not very well suited for being left alone. They also do not tolerate hot weather. One of the most social biggest dog breeds known for its calm temperament, however, they have a tendency to dominate. Unless they are properly trained, these dogs are not very friendly towards other dogs and strangers. Cane Corso is a type of mastiff that has its origins from Italy where it is used to protect properties and hunt large animals such as wild boars and herds. One of the biggest dogs in the world can reach upto 23 to 27 inches in height and weighs approximately 90 to 120 pounds. Talking about the appearance, the breed has a large head with almond-shaped eyes and looks like ears are cropped shortly after the birth of the dog breed. They have a large and muscular body. Cane Corso has an average lifespan of 10 to 12 years and on an average gives birth to 6 babies. One of the biggest dogs in the world known for its intelligence and popular as working dogs. The breed is people oriented and want to be close among them all the time. The breed needs at least 30 minutes of exercise daily, however, they can be well managed in an apartment with sufficient outdoor exercise. The breed does not like to bark much and enjoy the company of the family. The breed came to the United States in the 1980s and it was officially recognized the breed in 2004. This is one of the newly developed biggest dog breeds in the world. It can grow upto 26 to 28 inches and weighs approximately 80 to 143 lbs. The giant dog breed loves spending time with the owner and can grow upto 28 to 32 inches or more at the shoulder and weighs approximately 70 to 130 pounds. It was called by some other popular names such as Highland Deerhound, Rough Greyhound, and Scotch Greyhound. They are also known as the Royal Dog of Scotland. Talking about the appearance, the breed has a long head with broad ears and there is a muzzle near the black nose. The breed has brown or hazel eyes. One of the biggest dog breeds in the world is also the second tallest breed among all of them after Irish Wolfhound. The breed similar to Scottish Deerhound is known as far back as the 16th century. One of the largest dog breeds in the world can grow upto 75 to 160 pound that makes them unsuitable as apartment dogs. The breed is usually active in the morning and evening. It needs exercise daily approximately 3 times a day. They are popular as highly intelligent and independent breeds. It was developed in Tibet and initially used as a guard dogs for protecting livestock and property. Tibetan Mastiffs are known to be quiet dogs, however, when they are left outside in the night they became strong barkers. The giant dog breed was developed in Argentina and talking about the appearance, he has a massive head with cropped and natural ears along with a smooth white coat. The breed can weight upto 80 pounds and can grow upto 23.5 to 27 inches in height. Initially, it was used to hunt in Argentina and popularly known as the Argentinian Mastiff. It was developed by Dr Antonio Nores Martinez and his brother Agustin in the 1920s. The hard-working breed loves to cuddle despite the fearsome appearance. It was primarily used as a military and police dog and even search/rescue dogs. These were the 15 largest or biggest dog breeds in the world. If you have anything to say, you can comment below.